My passion for cooking arises from the curiosity of learning about foods from other cultures and expanding my knowledge in order to improvise how I can complement other foods with those of my Mexican background. Last week, I tested Goguma-matang or candied sweet potatoes that reminded me of a Mexican dish; camotes is a classic that my mom makes often. This is because the diversity of this dish with its mushy potatoes, sweet golden flavor with a touch of cinnamon allows it to be a light dessert after a meal, a sweet snack before bedtime with a cup of milk, or just a simple anytime treat to satisfy that sweet tooth. 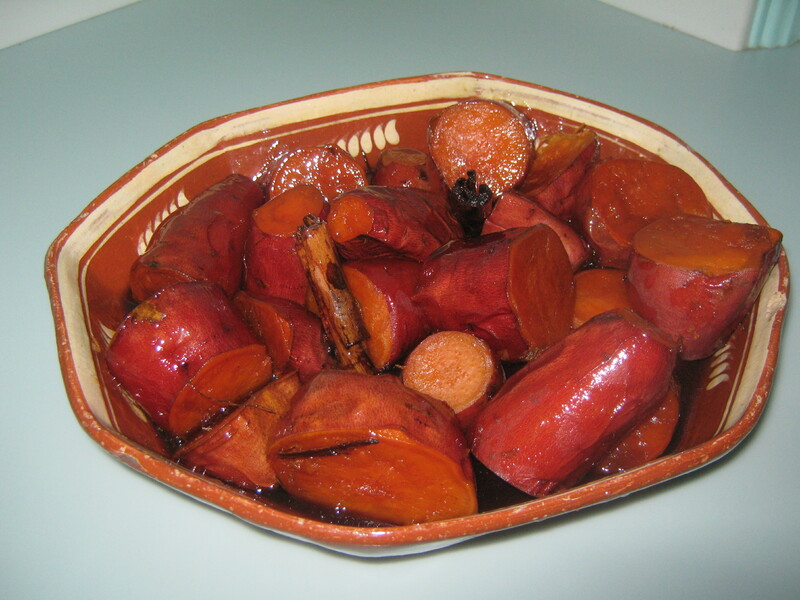 Combine all ingredients (piloncillos, cinnamon, water and yams) into a medium-sized pot. Allow mixture to come to a boil. Lower the temperature to medium-low heat and cover with a lid. Cook for about 1.5 hours or until the potatoes are tender. Remove the lid and allow sugar to thicken by raising the temperature to medium high for about 10 minutes, but do not allow the sauce to become too sticky. During my summer back in Berkeley, I came across a job posting on Craigslist for a recipe tester position. It was the first time I heard of such a position and immediately became excited at the opportunity of combining my love for cooking and my love for science. While testing recipes for Diane and Grace, it brought me back to my organic chemistry lab days when I had to accurately measure and follow directions in hopes that my experiment turned out well. A few days ago, I was instructed to test a recipe for making songpyeon (half-moon rice cakes). As usual, I started out by glancing over the recipe before taking a moment to read the history that provides me with some background and allows me to better understand the dish. Reading this portion is something I truly enjoy because it allows me to learn about Korean culture and cuisine. But a sentence caught my attention and made me pause and re-read it. It stated that the person that makes pretty songpyeon will have a pretty daughter. I found this idea captivating and a special touch to the history section of the recipe. However, when I began testing this recipe, this statement started to feel threatening to me. I felt the pressure of making this recipe work because like all women, I want to give rise to pretty daughters. At first, I played around with this idea, jokingly telling Diane that I did not want an ugly daughter, but proceeding with extra caution. Unfortunately, and without a doubt, I failed. Too many things went wrong, and I ran into trouble at almost every step. By the time I needed to shape the rice cakes, I had become frustrated so I decided to form the rice cakes as if I were making Mexican empanadas, something with which I was familiar. This approach did not help either and I lost hope, but carried on. My final product was deformed, oily, mushy, and definitely not pretty. Yesterday was Chuseok, a day where Koreans celebrate the fall and harvest season with food and drink. 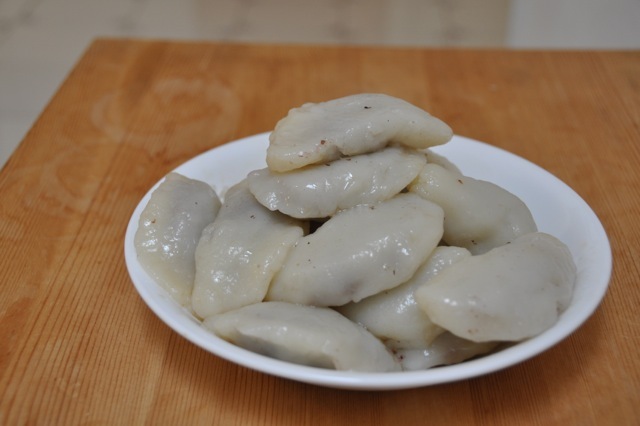 Songpyeon is one of the major foods prepared for Chuseok. I want to wish you a Happy Chuseok and the best of luck in making beautiful songpyeon.